WTF Are You Reading? 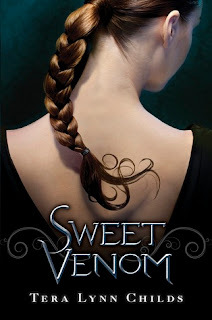 : You'll Love the Taste of "Sweet Venom"
The Plot- Tera Lynn Childs offers a fresh take on the mythos of Medusa and the Gorgons. Readers will find this decidedly feminine tale of heroism a welcome change in a genre that has been so long dominated by males, with women as hapless victims or relegated to roles of minor renown. Grace- Though hers is not the first voice that we hear in the story, it is indeed the one that speaks to readers the loudest. In this first book, it is Grace's footsteps that we follow along the path that leads not only to the realization of her destiny, but that of her sisters as well. She also serves as the heart of the book. She is the character that is allowed to be the most flawed and thereby the most relateable. Tera Lynn Childs. The varied cultures and diversity that this city provides assures that though the action is confined to this one space; there is no chance that scenes could become repetitive. The Monsters- There is no question that there was a great deal of research done when it came to the mythic baddies of this work. Their actions descriptions and mannerisms were true to myth and the shear number and variety of them was astounding. Greer and Gretchen- They were basically two sides of the same coin, tough exterior with soft underbelly, eager to please and afraid of being hurt. So much time was spent on the development of the character of Grace, that these two came off rushed and rather one dimensional. The Boys- Milo and Nick seem to always be in the wrong place at the right time. Hopefully that will serve some higher purpose later, but for right now...IT'S ANNOYING!!!!!!!!!!!!! Timing- The length of time between the beginning of the story and when Gretchen and Grace team up is perfect, it is the rush job occurs toward the end and the way that Greer is almost an after thought that truly detracts from the story as a whole. It is my hope that the "minuses" that I listed in my review are nothing more than "first bookitis" and as is often the case, will be rectified in the books that follow. This book is a breath of fresh air in YA and I can't wait for more. Love your review, completely honest. Looks like a good story. Do you review mysteries? I love murder mysteries. Thank you. I love your review on Sweet Venom! I don't think I could have written my thoughts about this book any better than you did! I think I will have to check out your reviews on the books I am looking at more often. Thanks for taking the time to write reviews for all of us readers out there! I love Greek myths, although not so much the myth of Medusa. I'm not sure if I want to read this book. Fantastic review - I have now added this book to my TBR pile!!! :) I love how you clearly write your plus and minus points!